Previous studies on isolated islets have demonstrated tight coupling between calcium (Ca2+) influx and oxygen consumption rate (OCR) that is correlated with insulin secretion rate (ISR). To explain these observations, we have proposed a mechanism whereby the activation of a highly energetic process (Ca2+/metabolic coupling process [CMCP]) by Ca2+ mediates the stimulation of ISR. The aim of the study was to test whether impairment of the CMCP could play a role in the development of type 2 diabetes. Glucose- and Ca2+-mediated changes in OCR and ISR in isolated islets were compared with the time course of changes of plasma insulin concentrations observed during the progression to hyperglycaemia in a rat model of type-2 diabetes (the University of California at Davis type 2 diabetes mellitus [UCD-T2DM] rat). Islets were isolated from UCD-T2DM rats before, 1 week, and 3 weeks after the onset of hyperglycaemia. Glucose stimulation of cytosolic Ca2+ and OCR was similar for islets harvested before and 1 week after the onset of hyperglycaemia. In contrast, a loss of decrement in islet OCR and ISR in response to Ca2+ channel blockade coincided with decreased fasting plasma insulin concentrations observed in rats 3 weeks after the onset of hyperglycaemia. These results suggest that phenotypic impairment of diabetic islets in the UCD-T2DM rat is downstream of Ca2+ influx and involves unregulated stimulation of the CMCP. The continuously elevated levels of CMCP induced by chronic hyperglycaemia in these islets may mediate the loss of islet function. An essential step triggering insulin secretion by pancreatic beta cells is closure of KATP channels leading to the opening of voltage-dependent Ca2+ channels . Increased metabolic rate generates another essential signal, without which increased Ca2+ influx does not stimulate ISR [2, 3]. A number of factors generated by increased metabolism have been proposed including NADPH , fatty-acid signalling , ATP/ADP ratio , cytochrome c , mitochondrial GTP , reactive oxygen species  and factors associated with pyruvate carboxylase and anaplerosis [10, 11, 12]. How beta cells integrate both Ca2+ and metabolic factors is not understood, but we have hypothesised the existence of a cascade of steps that are dually regulated by these two factors and govern the triggering of insulin secretion . We have named this process, linking the Ca2+ signal with insulin secretion, the ‘Ca2+/metabolic coupling process (CMCP)’ and have sought to characterise its defining features by quantifying metabolic and electrophysiological variables of isolated islets [13, 14]. The major identifier of the CMCP is its use of approximately 35% of glucose-stimulated energy production, which cannot be accounted for by the energy used in exocytosis of secretory granules . The CMCP can be quantified by the decrement of glucose-stimulated oxygen consumption rate (OCR) in response to blocking the influx of Ca2+, a variable reflecting the work associated with Ca2+-activated processes . The link between OCR and ATP usage is supported by studies demonstrating that the majority of ATP is generated by mitochondrial respiration . Importantly, the OCR linked to the CMCP is highly correlated with substrate-stimulated insulin secretion rate (ISR) , and its activation is essential for sustained insulin secretion to occur . Like ISR, it is under dual control by both Ca2+ entering the cell via L-type Ca2+ channels  and metabolic rate . Finally the process is upstream of potentiation of glucose-stimulated ISR by protein kinases whereby ISR is increased without significantly altering OCR [14, 15]. These observations lead us to hypothesise that the combination of Ca2+ influx and metabolic rate leads to the activation of a highly energetic process (CMCP) that couples Ca2+ to its effect on ISR . To further establish the validity of this hypothesis, we tested whether impairment of the CMCP could play a role in the progression of type 2 diabetes. The approach taken involved measurements on islets isolated from diabetic rats at different stages in the development of hyperglycaemia and decreased insulin secretion. The diabetic rat model used (University of California at Davis type 2 diabetes mellitus [UCD-T2DM]) was generated by crossing obese insulin-resistant Sprague–Dawley rats with ZDF-lean rats, which have a defect in beta cell function . The progression of glycaemic control in the model was characterised by euglycaemia in the young rats, followed by steadily increasing circulating glucose levels accompanied by increased ISR. After onset of hyperglycaemia, by 3 weeks ISR declined and by 3 months a large fraction of the beta cells were destroyed. Previous studies carried out on islets from these rats indicated that loss of secretory function did not correlate with loss of islet volume or number . Therefore, we concluded that impaired islet secretory function was likely to underlie the decreased plasma insulin concentrations observed concomitant with increasing glucose levels, and that the UCD-T2DM rat was an appropriate animal model with which to investigate the longitudinal role of the CMCP in islet function. The aim of the study, therefore, was to investigate the intracellular mechanisms responsible for the impaired secretory function that develops between 1 and 3 weeks after onset of hyperglycaemia. Isolated islets underwent analysis of multiple variables reflecting sequential components in the stimulus–secretion coupling pathway. Thus, glucose stimulation of metabolism was assessed by increases in OCR, opening of voltage-dependent Ca2+ channels was assessed by cytosolic Ca2+ and activation of the CMCP was assessed by the decrement in OCR in response to blocking Ca2+ influx. These variables were compared longitudinally with plasma insulin concentrations measured in vivo to determine which step(s) were associated with the decline of islet secretory function. Based on standard analysis of islet metabolic and Ca2+ response, the islets appeared functionally intact. However, our results showed that dysregulation of the CMCP occurring downstream of Ca2+ entry is associated with markedly reduced ISR and plasma insulin concentrations during the transition to hyperglycaemia/overt diabetes. KRB supplemented with 20 mmol/l HEPES/NaHEPES (Roche, Indianapolis, IN, USA) and 0.1% bovine serum albumin (Serological Corporation, Norcross, GA, USA) was used for perifusion experiments and was made as previously described . Male UCD-T2DM rats were housed in the animal facility in the Department of Nutrition at the University of California, Davis and maintained on a 14:10-h light–dark cycle. Rats characterised as hyperglycaemic or diabetic (blood glucose > 11.1 mmol/l for 2 consecutive days ), were studied either 1 week or 3 weeks after onset. Blood glucose was determined on 5 μl of whole blood using a OneTouch Glucometer (Lifescan, Milpitas, CA, USA). Male Sprague–Dawley rats (used as controls) were purchased from Harlan (Livermore, CA, USA). The experimental protocols were approved by the Institutional Animal Care and Use Committees of the Universities of Washington and California, Davis. Islets were harvested by collagenase digestion of the pancreas and purified as previously described [18, 19]. Rats were anaesthetised by intraperitoneal injection of sodium pentobarbital (35 mg/230 g rat). Before the experiments islets were cultured for 18 h at 37°C in RPMI Medium 1640 containing 10% fetal bovine serum (Invitrogen, Carlsbad, CA, USA). A perifusion system was used that concomitantly measured OCR and cytochrome c reduction while collecting outflow fractions for subsequent determination of ISR [18, 20, 21]. Islets (125–175) were loaded into in each of two perifusion chambers. OCR was calculated as flow rate (30–40 μl/min) multiplied by the difference between inflow and outflow oxygen tension measured by detecting the phosphorescence lifetime (MFPF-100; Tau Theta, Boulder, CO, USA) of an oxygen-sensitive dye painted on the inside of the perifusion chamber . Absorption by cytochrome c was measured by light transmitted at 550 nm through the bed of islets/Cytodex beads . Insulin was measured by ELISA (Mercodia, Uppsala, Sweden) or RIA (Millipore Corporation, Billerica, MA, USA). Formalin-fixed, paraffin-embedded pancreas sections (5 μm) were stained with anti-insulin antibody (1:2,000; Sigma-Aldrich, St Louis, MO, USA) followed by biotinylated goat anti-mouse IgG (1:500; Jackson ImmunoResearch, West Grove, PA, USA), Vector ‘Elite’ ABC-HP (Burlingame, CA, USA), 3,3′-diaminobenzidine substrate and haematoxylin counterstain and then mounted on coverslips. Whole slide images were generated using a Nanozoomer Digital Pathology slide scanner (Olympus America, Center Valley, PA, USA). The insulin-positive area was computed based on pixel colour and density for each section using Visiopharm software (Hoersholm, Denmark) and verified by manual examination of segmented images. Total (100%) section area (149 ± 8 mm2, mean ± SEM) was assessed, and total pancreas area was determined as the sum of insulin-negative and insulin-positive pancreas areas. Insulin content per islet was determined in wells of 24-well plates (in triplicate) containing five islets in 0.2 ml of culture media, after adding 1 ml of a hydrochloric acid/95% ethanol mixture (2% vol./vol.) and incubating for 60 min. After centrifugation at 800 g for 5 min, the supernatant fraction was transferred to fresh tubes, and insulin was measured by ELISA (Mercodia). For some experiments, islet insulin content was measured immediately following their isolation, and no differences were seen relative to islets cultured overnight (data not shown). Cytosolic Ca2+ was measured by fluorescence imaging after islets were incubated in 2 μmol/l Fura-2 AM (Invitrogen) and 0.02% pluronic acid for 40 min at 37°C and perifused in KRB (containing 5 mmol/l NaHCO3) as previously described . Results are displayed as the ratio of the fluorescent intensity during excitation at either 340 or 380 nm (F340/F380). Blood samples were collected after an overnight (12 h) fast from the tails of male UCD-T2DM rats (n = 7 per group). Non-fasting blood glucose concentrations were measured before fasting (at 14:00–16:00 hours) using a glucometer. Plasma was assayed for glucose and insulin concentrations using an enzymatic colorimetric assay (Thermo DMA, Louisville, CO, USA) and ELISA (Millipore, St Charles, MO, USA), respectively. The basic protocol for the OCR, ISR and Ca2+ perifusion experiments entailed a 90-min baseline period at 3 mmol/l glucose followed by stimulation with 20 mmol/l glucose for 60 min and subsequent inhibition of Ca2+ influx with 5 μmol/l nimodipine for 60 min. OCR data are displayed as the change relative to the baseline calculated as the average of values obtained between −10 and 0 min. To assess mitochondrial uncoupling in islets, the protocol entailed the inhibition of the F0F1ATPase with oligomycin to remove the coupled portion of OCR [23, 24], followed by the addition of a mitochondrial uncoupler (FCCP). Steady-state values were calculated as the average of the final 10 min of each experimental condition. Statistical significance (p values) was generated from the calculation of ANOVA with a post hoc Bonferonni test using Kaleidagraph (Synergy Software, Reading, PA, USA), except for the immunohistochemical data upon which a Student’s t test using Microsoft Excel (Redmond, WA, USA) was performed. Islets from three groups of UCD-T2DM rats were compared: euglycaemic, and 1 or 3 weeks after the diagnosis of hyperglycaemia (fed blood glucose concentrations > 11.1 mmol/l for two consecutive measurements). Age, weight and blood glucose levels were recorded for all rats just before islet harvest (Table 1). The ages and weights of the three groups of UCD-T2DM rats were similar. Blood glucose concentrations were approximately twofold higher in the rats 1 week after onset of hyperglycaemia relative to euglycaemic rats (p < 0.001) and further increased to approximately threefold higher in the rats 3 weeks post onset (p < 0.001). Control data were obtained from islets isolated from Sprague–Dawley rats, which were slightly younger and lighter than the UCD-T2DM rats. A second cohort of male UCD-T2DM rats were used to characterise circulating glucose and insulin concentrations at times corresponding to the times that the islet measurements were made. Non-fasting blood glucose was significantly elevated in UCD-T2DM rats 1 and 3 weeks after onset of hyperglycaemia (Fig. 1). Insulin was elevated 1 week following onset but decreased by 3 weeks despite the continued hyperglycaemia. To determine whether disruption of the CMCP was associated with the loss of regulated insulin secretion occurring 1–3 weeks following onset of hyperglycaemia, we first measured variables reflecting the operation of the CMCP in islets harvested from control Sprague–Dawley rats. As expected, all three measurements increased robustly in response to increased glucose concentrations (Fig. 2). The subsequent blockade of Ca2+ influx by L-type Ca2+ channels (with 5 μmol/l nimodipine) decreased steady-state OCR by 0.16 ± 0.03 (about one third of that stimulated by 20 mmol/l glucose) reflecting the energy used by the CMCP; ISR was completely abolished demonstrating the tight coupling between Ca2+ influx, ATP usage and insulin secretion. The Ca2+ response to glucose was biphasic; due to the slower flow rates required when measuring OCR and ISR, first phase insulin secretory response to glucose was not observed. To determine which component of stimulus-secretion coupling was correlated with decreased plasma insulin concentrations in UCD-T2DM rats, we repeated the measurements presented in Fig. 2 using isolated islets harvested before, and 1 and 3 weeks after, onset of hyperglycaemia. Islets harvested from UCD-T2DM rats before the onset of hyperglycaemia had normal responses in OCR to glucose, but only ~50% of the Ca2+ and ISR response seen in the islets from control rats (Fig. 3a, Table 2). The OCR responses to nimodipine were qualitatively similar, but the changes were smaller than that for control islets (decrement of OCR as a percentage of the glucose-stimulated increase was 22 vs 34% for the pre-onset and control islets, respectively [Table 2]). Likewise for islets harvested from UCD-T2DM rats 1 week after onset of hyperglycaemia, the two variables reflecting operation of the CMCP, the decrement in OCR and ISR in response to nimodipine (Fig. 3b), were similar to those observed in islets harvested before onset. Notably, glucose-stimulated ISR by islets harvested from rats 1 week after onset of hyperglycaemia was increased by 65% compared with islets harvested from rats before the onset. Islets harvested 3 weeks after onset of hyperglycaemia exhibited decreased glucose-stimulated ISR, but normal Ca2+ response and only slightly reduced ∆OCR in response to 20 mmol/l glucose relative to pre-onset islets (Fig. 3c), indicating that the loss of ISR was not due to the inability of islets to respond to increased metabolism by closure of KATP channels. In contrast, Ca2+-sensitive OCR was nearly completely abolished, and ISR was only partially inhibited by inhibition of Ca2+ influx (Fig. 3c), suggesting that the coupling between Ca2+ influx, energy consumption and ISR was lost. The steady-state values of measured variables in islets shown in Figs 2 and 3 were tabulated and compared with the longitudinal changes of fasting plasma insulin concentrations in UCD-T2DM rats (Table 2). During the progression from euglycaemia to hyperglycaemia, the responses of ISR measured in vitro mirrored the changes of fasting plasma insulin seen in vivo, while glucose stimulation of OCR and cytosolic Ca2+ in islets remained unchanged. Notably, the disappearance of the Ca2+-sensitive OCR coincided with the marked decline of plasma insulin concentrations that occurred 3 weeks after the onset of hyperglycaemia. The extent of uncoupling in islets has been assessed by inhibition of the F0F1-ATPase; this stops the dissipation of the proton gradient across the mitochondrial membrane that is supported by electron transport chain activity but not that due to uncoupled proton leak [25, 26]. Accordingly, islets were perifused as in Fig. 2, but instead of blocking Ca2+ channels, the F0F1ATPase was inhibited by oligomycin, followed by the mitochondrial uncoupler carbonyl cyanide-p-trifluoromethoxyphenylhydrazone (FCCP). In control islets glucose-stimulated OCR decreased in response to oligomycin by 82 ± 1.4% (Fig. 4a) and was increased by the uncoupling agent FCCP, suggesting that mitochondria in normal glucose-stimulated islets are largely coupled. However, simultaneous measurement of cytochrome c reduction indicated that some of the OCR decrease may have been due to inhibition of metabolic pathways by the two agents, as cytochrome c reduction dropped in parallel with the OCR. Irrespective of the possible error associated with using metabolic poisons, OCR decrements due to oligomycin were similar in islets from both euglycaemic and 3-week hyperglycaemic UCD-T2DM rats (Fig. 4b) to those observed with control rat islets, indicating that changes in the uncoupling state of mitochondria are not likely to mediate changes in Ca2+-sensitive OCR that occurred during this period. Islets from UCD-T2DM rats initially contained insulin stores that were similar to those of the islets from control rats, and then decreased precipitously between 1 and 3 weeks following the onset of hyperglycaemia (Fig. 5). Despite this change in insulin content, secretion was still 70% of that by islets from euglycaemic UCD-T2DM rats (Table 2), suggesting that insulin content had not become limiting. The yield of islets harvested from UCD-T2DM rats was low at all stages compared with the yield from control rats (130 ± 8 vs 418 ± 17 islets/rat). However, due to the increase in size of islets from UCD-T2DM rats, the total islet volume harvested (calculated by estimating the size of the islet diameter and assuming each islet was spherical) was similar in the two rat strains (7.3 ± 0.5 vs 5.9 ± 0.2 μl). To determine whether beta cell loss contributed to impaired ISR, the insulin-positive area relative to total pancreatic area was quantified in pancreas sections. Clear fragmentation and damage to the UCD-T2DM rat islets was evident even before the onset of hyperglycaemia (Fig. 6a–d). However, beta cell area, quantified by an automated imaging system (as illustrated in Fig. 6e, f), tended to be higher in euglycaemic UCD-T2DM rats relative to control rats (p = 0.12), consistent with the higher OCR at low glucose, and was not decreased in 1-week-onset rats relative to pre-onset UCD-T2DM rats (Fig. 6g). Beta cell area in islets from rats with hyperglycaemia longer than 10 weeks, though, was significantly decreased (Fig. 6g). These data do not support beta cell loss as a primary mediator of the loss of insulin secretory function that occurs early in the course of hyperglycaemia in UCD-T2DM rats. Based on previously obtained data from in vitro experiments showing a tight correlation between the CMCP (as reflected by Ca2+-sensitive OCR) and ISR [13, 14, 15], we hypothesised that loss of CMCP regulation during the progression of the diabetes in the UCD-T2DM model would coincide with the decrease in plasma insulin concentrations during the progression of hyperglycaemia seen in vivo . Glucose-stimulated OCR and Ca2+ did not change significantly in islets harvested following the onset of hyperglycaemia, and glucose stimulation of ISR was still operational in the diabetic islets. Therefore glucose sensing and steps generating an increased energy state leading to closing of KATP channels and Ca2+ influx, the standard focus of islet functional analysis, were intact. Our approach to evaluating islet function centred on responses to blocking glucose-stimulated Ca2+ influx, which in normal islets leads to a reproducible decrease in OCR and complete cessation of insulin secretion [14, 15]. The main finding of this study was the demonstration that loss of Ca2+-sensitivity of OCR and ISR coincided with the decreased plasma insulin levels seen in UCD-T2DM rats. The results are consistent with a link between dysregulation of steps downstream of Ca2+ influx (those comprising the CMCP) and the loss of glucose-stimulated ISR observed after prolonged hyperglycaemia. A goal of the study was to obtain in vitro data that would generate a candidate mechanism to explain the decline in plasma insulin levels occurring after exposure to chronic hyperglycaemia. Our initial interpretation of the lack of change in OCR of diabetic islets in response to Ca2+ channel blockade was that the CMCP was no longer functional. However, OCR, Ca2+ and ISR were still robustly stimulated by glucose and, furthermore, insulin secretion was still observable in the presence of Ca2+ channel blockade, indicating that the CMCP was still operational. In islets from control rats, blocking Ca2+ influx by L-type Ca2+ channels abolishes sustained insulin secretion by all known physiological secretagogues including glucose, fatty acids  and amino acids , as well as potentiators of nutrient-stimulated ISR including acetylcholine and GLP-1 . Thus, the continued secretion of insulin in the presence of nimodipine observed in islets 3 weeks after the onset of hyperglycaemia was unexpected, as was the ability to secrete insulin in response to glucose by islets that do not decrease OCR in response to blocking Ca2+ influx. The most likely explanation for these observations is that the CMCP in diabetic islets remains constitutively activated, which would result in the observed lack of OCR response to nimodipine, thus allowing glucose to stimulate ISR in the presence of nimodipine. This explanation was further supported by results showing that glucose-stimulated OCR was not diminished in these islets. The decrease in insulin levels seen in vivo, in the face of continuously activated CMCP, suggests that the chronically stimulated CMCP does not favour the maintenance of appropriately regulated ISR by the islet (represented schematically in Fig. 7). How this happens is still under investigation, since at this point we have not shown a causal relation between overstimulation of CMCP and decreased ISR. Future work will involve assessing islets from UCD-T2DM rats that are treated with insulin and DPP-4 inhibitors. Although it is clear that islets from rats 3 weeks post-onset of hyperglycaemia are functionally impaired, we also considered the potential contributions of loss of insulin content or beta cell area. Although beta cell mass in the UCD-T2DM rat ultimately declines with long-term hyperglycaemia , neither islet yield nor beta cell area were decreased during the transition to hypoinsulinaemia (1–3 weeks). Islet insulin content fell dramatically during the transition from hyper- to hypo-secretion of insulin seen in vivo . It seems likely that this was a factor in the impaired secretory function observed in vivo, but the continued robust response of ISR in response to glucose in vitro suggests that content of insulin had not reached levels low enough to become strongly rate limiting. The loss of insulin content could be mediated by the increased energy demands of continuous operation of the CMCP, as suggested by studies where diazoxide, a blocker of the CMCP , prevents loss of insulin content in hyperglycaemia . Consistent with increases in beta cell mass typically observed in obese rodents [30, 31], many islets isolated from the UCD-T2DM rats at all stages of glycaemia studied were hyperplastic and over 300 μm in diameter. As would be expected from islets with greater numbers of beta cells, the overall OCR per islet was much larger (two- to fourfold greater than that observed in normal-sized islets). Since the increased beta cell area was less than twofold that of controls, it follows that the elevated basal OCR might be in part due to greater numbers of non-beta cells. However, the changes in ISR and OCR stimulated by glucose were similar to those seen in the islets from control rats. In addition, since the larger islets harvested from euglycaemic UCD-T2DM rats behaved qualitatively similarly to the control islets, our data does not suggest that hyperplasia of the islets is in itself a factor governing the impairment of function in vivo . Neither does increased uncoupling of mitochondria appear to play a role in mediating the transition between normally functioning islets and a lack of Ca2+-sensitivity of the OCR. Thus the loss of secretion in vivo is most strongly associated with changes in the coupling between Ca2+, OCR and ISR, and perhaps changes of insulin biosynthesis, but not with changes in mass or size of the islet population. Based on the nearly identical cytosolic Ca2+ responses to glucose, and equal contribution by L-type Ca2+ channels to this response, by pre- and post-diabetic islets, we favour the conclusion that the loss of Ca2+-sensitive OCR and ISR was due to steps downstream of Ca2+ signalling. However, the method of measurement that we used for determining cytosolic Ca2+ cannot resolve gradients of Ca2+ within the cell, particularly in microdomains surrounding the secretory granules. Therefore it cannot be ruled out that even if the overall flux into the cell through L-type Ca2+ channels was not impaired during the transition to hypoinsulinaemia, Ca2+ may preferentially accumulate in sites away from processes controlling OCR and ISR during the progression of diabetes. In this case, a low CMCP response would be achieved due to lack of stimulation by L-type Ca2+ channels. In such a scenario, Ca2+ from other channels could support the continued secretion of insulin in the face of greatly diminished L-type Ca2+ channel activity. 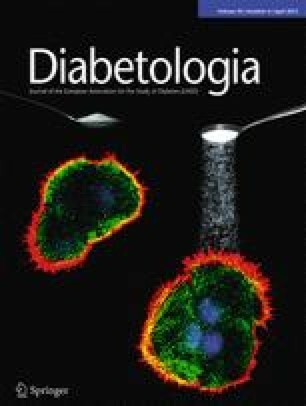 Although islet mass remains relatively stable up until 2 months post-onset of hyperglycaemia, previous studies have demonstrated marked disruption of islet structure 3 months after the onset of diabetes . Whether continuous activation of the CMCP is detrimental to islet viability or proliferation was not determined in the present study, although this possibility is supported by studies showing a link between Ca2+, endoplasmic reticulum (ER) stress and beta cell death [33, 34]. Consistent with the notion that continued overstimulation of Ca2+-activated processes in the beta cell is harmful, it has been shown that diazoxide reduces islet apoptosis and ER stress in the face of exposure to palmitate  and stimulation of KATP channel activity protects murine pancreatic beta cells against oxidative stress induced by H2O2 or sulfonylureas . Therefore our findings provide a novel demonstration that constitutive activation of Ca2+-stimulated energy usage precedes the destruction of islets in the UCD-T2DM rat and is associated with loss of islet function. The Visiopharm beta cell quantification analysis algorithm was developed jointly by the Cellular and Molecular Imaging Core of the University of Washington Diabetes Research Center and the Histology and Imaging Core located at the University of Washington. This research was funded by grants from Merck Investigator Initiated Sponsored Program (No. 33171), the National Institutes of Health (DK17047 and DK063986) and the Washington State Life Sciences Discovery Fund. P. J. Havel’s laboratory also receives, or received, support during the time the experiments were conducted from NIH grants R01 HL075675, R01 HL091333, AT002599, AT002993, AT003645 and the American Diabetes Association. BPC, SCG, RLH, PJH, and IRS made substantial contributions to the conception and design of the study as well as the analysis and interpretation of the data; AMR, BJR, BPC, S-RJ, KLS and JLG contributed a significant quantity of data and method development. All authors participated in the drafting the article or revising it critically for important intellectual content, and gave final approval of the version to be published.